We also provide the statue of Shiv Parvati and Ganesh Ji Moorti to our clients as per their requirement. 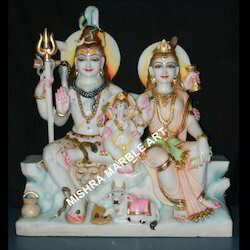 In this statue, lord Shiv and goddess Parvati sitting together with lord Ganesha in the center. Apart from this, Nandi bull, lord Shiva’s vahana at lying at his feet. We use soft pink colored paints that enhance the features of this white marble statue. The God Shiv Parvati And Ganesh Ji we offer to clients exudes a pleasant and serene feel. 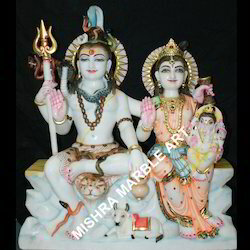 This marble statue showcases lord Shiv and goddess Parvati sitting together with lord Ganesha in the center. One can also see Nandi bull, lord Shiva’s vahana at lying at his feet. All the details have been carved out with extreme intricacy and dexterity. 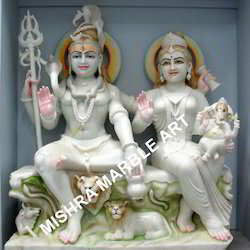 Soft pink colored paints have been used to enhance the features of this white marble statue. 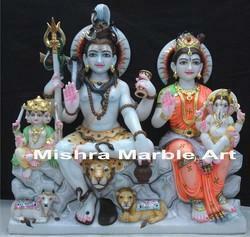 We also provide the statue of Shankar Parvati And Ganesh Ji Marble Idol to our clients as per their requirement. The statue depicts lord Shiv, goddess Parvati sitting with their children lord Ganesha and lord Kartik. Further in this statue, lord Ganesha is sitting in his mother’s lap while lord Kartik is sitting alongside his father. We bring forth for our clients a broad spectrum of Idols Shiv Parvati And Ganesh Ji. Our professionals use white marble stones that are sourced from trusted vendors of the market. The experts carve out the details of the facial expressions and gesture carefully. Our range can be availed at industry leading price rates. 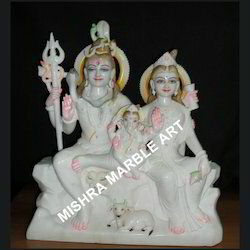 We offer an iconographic representation of Marble Shiv Parvati and Ganesh Ji Idols as Ardhanarishvara, wherein the one half of the body is male and the other half is female. The professional artisans make judicious usage of available resources. Our products are resistant to cracks and are offered at reasonable price rates. A wide range of Gauri Shankar Moorti are available. 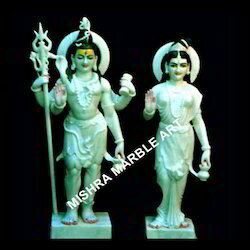 We provide a wide range of Lord Shiv Parivar Statue to our clients, which is made using white marble statue. In this statue, lord shiva and parvati sitting on kailash mount in an artistic pose. This statue depicts the lord holding his trident and raising his hand to give boons. Further, goddess ganga can be seen flowing from the tied dreadlocks of lord shiva. Apart from this is also a snake that is wound around shiv neck. Moreover, goddess parvati is sitting alongside with her right hand in a boon giving gesture. 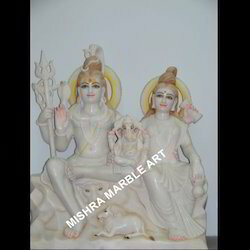 We provide a wide range of Lord Shiv Parivar Statue to our clients, which is made using white marble statue. In this statue, lord shiva and parvati sitting on kailash mount in an artistic pose. 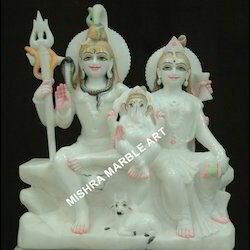 We have in store for our clients an attractive range of Marble Shiv Parvati. The statue depicts the god and goddess seated with a peaceful countenance. With the usage of subtle pastel colors on white marble stone, the beauty and elegance of the structure get enhanced even further. 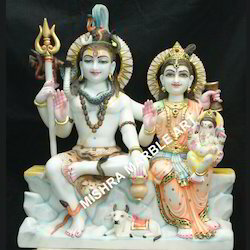 With the help of our experts, we offer an exclusive range of Kailash Shiv Parvati Ji Statue to our clients at competitive prices. 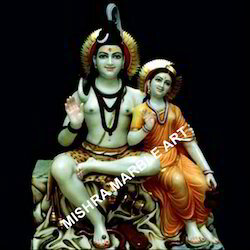 In this statue, god shiva and goddess parvati sitting on kailash mount. Our statue is colorful, vibrant and is perfect for temples. Furthermore, we are committed to meet the bulk demand of our clients within a given timeline. 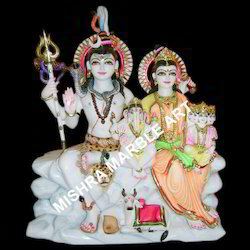 Our organization is engaged in providing a superior range of handicraft Shiv Parvati Ji Idol to our clients. 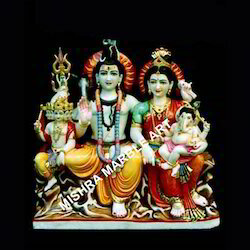 In this statue, lord shiv and godness parvati is in standing form. Our range is exclusively crafted by our experts and acknowledged for the quality and smooth finishing features. We offer our range at reasonable prices. A wide range of shankar parvati moorties are available. Looking for Shiva Parvati Moorties ?